Visual Studio Code>Programming Languages>Fancy ReactNew to Visual Studio Code? Get it now. 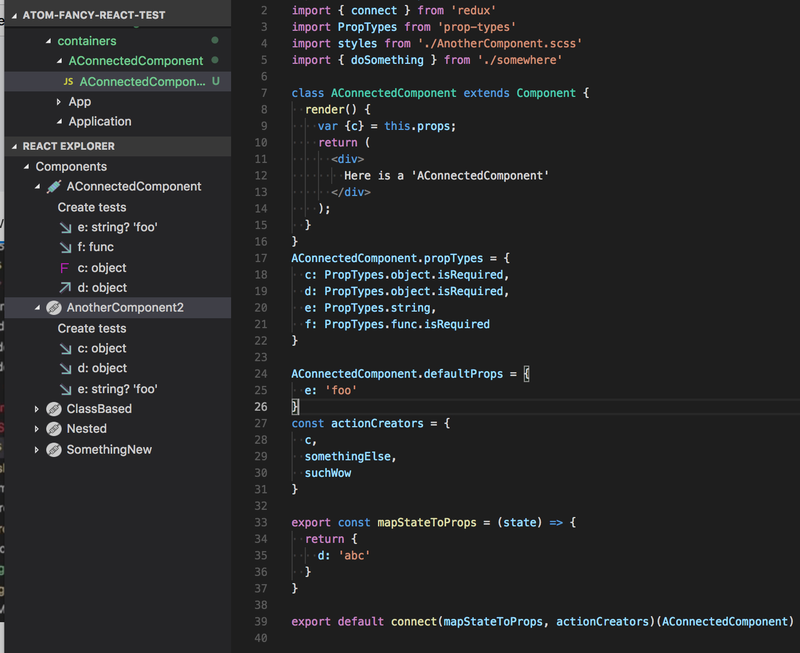 An extension for Visual Studio Code that helps to automate building react apps, following your preferred project layout. Currently it is assumed that unit test files are using jest, enzyme and chai. Start from a snippet of a proposed React component in some jsx somewhere, and generate a skeleton implementation of that new component. The intention is that the component name, and the names of the essential properties passed to the component, can be typed directly in an existing parent, pretending that it already exists. The code generation can then scaffold as much of that new component as possible. Start from a source code file containing exported functions and classes, and generate a test file with suites for each export. If the test file doesn't exist, then create it using a sensible path and naming structure. If the file does already exist, then merge any existing tests and suites with the ones that have been generated for you. A handy shortcut to quickly jump between a source file and it's corresponding test file, and back. Get a preview of the components found in your project, with details like the properties found on each component. This feature is quite new and will be under active development. Right now, it only detects class based components. This is currently disabled by default, you will need to set fancyReact.treeViewEnabled = true. The current workflows and generated code are built around a few basic assumptions about how the React project is laid out. The set of supported configurations and conventions will be expanding over time. All configuration items can be set globally using the standard vscode settings format, using the key names listed below. For example, to define a standard test suffix for all repos you edit, you would set the settings key fancyReact.testSuffix = "-test". If you have a React repo that needs some specific configuration, you can include keys inside that repo's package.json file, under a fancyReact key. You can see an example config in the package.json file for atom-fancy-react-test. The examples here all describe a component defined at <rootDir>/client/src/components/Foo/Foo.js. Currently you need to restart VSCode to pick up any changes to settings. Specify the general strategy for storing test files. What is the path within the react root to get to the test files. In ParallelDirs mode, for the example above, test. This is also a valid value for SubDir mode, it will nest test files under their source folder at test. The suffix to append to the source file name. For example, -test. If your project uses eslint to enforce syntax requirements, any code generation will try to find local eslint configuration, and use this to 'fix' generated syntax. This is not perfect but will generally do a good match of creating acceptable syntax. This extension for VSCode has been ported from an atom plugin with the same goals, which is available here. The bulk of the parsing code has been extracted to a dedicated platform agnostic library https://github.com/eddiesholl/fancy-react-core/ At some point, the atom version could be migrated to consume this new code base, but for now it is not under development. In general if the plugin is not behaving how you expect, it can be useful to open up the Output window and have a look for any error messages. There is a sample package available at https://github.com/eddiesholl/atom-fancy-react-test that offers an example package structure that works with this plugin, and some sample components to play around with. For example, there are some missing components that can be generated to complete the implementation. The success of this package is based on supporting a wide range of dependencies, styles, approaches and package conventions. If your particular configuration is not supported, feel free to open an issue and describe the changes you are looking for. Pull requests are also most welcome! It would be awesome to get an overview of all the components in the current repo, how they are nested, and the props each one exposes. There are many conventions and possible structures for how to lay out a React project. For example, maybe you store test files next to source files, or in a subfolder, or maybe you use a different naming format. There are some limitations in the node types currently supported by estree-builder. For example, functions are all declared using traditional function syntax, rather than 'fat arrow' style. It should be possible to expose hook points that let others develop plugins that extend this one. For example, other unit test syntax could be provided with, for example, a fancy-react-jasmine plugin. There's no reason that these command should only be available within atom. They could be re-exposed by a CLI wrapper that can run outside of atom.